The proposed design for the MASDAR HQ, is conceived as a new type of Landmark; we envision an architecture that seeks its inspiration from timeless traditional, regional architectural models that respond to climate and culture, and re-interprets these in a matt building, creating an image appropriate to Abu Dhabi Future Energy Company and to the prestige of the UAE. 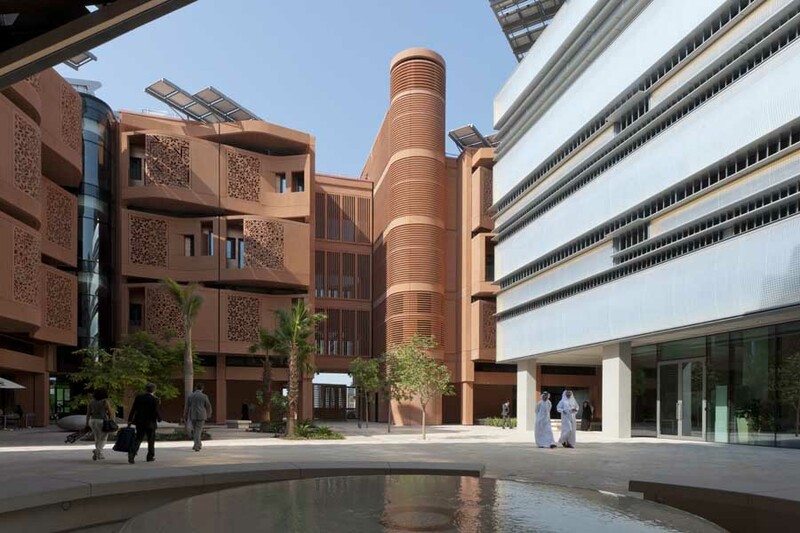 The design approach is concerned with the comfort that MASDAR Headquarters should offer and at the same time with the question as to how this comfort can be attained with a maximum of energy savings. Understanding and making use of the local environmental influences is a central principle of this design. The basic form of MASDAR Headquarters is an inside-out matt building that protects against harsh desert sun while maximizing shaded light and views. In its center, are 9 cone shaped exterior courtyards that extend uninterrupted from the top of the building to the lowermost level. The cone walls differ in design based on the orientation and exposure; to maximize light to the office interiors, locate PV panels and to allow for green roofs and walls. The concept of the garden oasis is intrinsic to the MASDAR Headquarters in several ways. The site and its landscape consist of a series of special, semi-private gardens of water, greenery, and palm trees associated with various program elements. In the building, there are five outdoor sky-gardens for the offices placed within each of the courtyard cones. A roof top garden is a common component of green architecture. Retaining rainwater and reintroducing it into the natural life cycle through evaporation slows the steady trend towards sealing off and paving over our living space. This saves cooling energy and raises thermal comfort within the building. The complex structural geometry of the building is designed to push the primary structure to the exterior envelope of the building where its efficiency in resisting critical lateral wind and seismic loads are maximized. The current proposed primary structure employs built-up monolithic surface structure in the place of an exposed primary steel frame, as a more appropriate solution to the local climate, traditions and building technologies. Masdar is Abu Dhabi’s multi-faceted, multi-billion dollar investment in the development and commercialization of advanced and innovative technologies in renewable, alternative and sustainable energies as well as green design. By applying scale and leveraging Abu Dhabi’s low-cost, tax-free manufacturing base, businesses will enjoy significant competitive advantages, allowing them to compete internationally and provide significant diversification to the Abu Dhabi economy. On February 9, 2008, Masdar broke ground for Masdar City, the world’s first zero-carbon, zero-waste, car-free city.